If you follow us on Facebook, then you’ll already know I FINALLY got my horse trailer! And actually, this is the first horse trailer I’ve ever owned. I’ve bought and sold cars every few years, for decades. But this purchase took me ages to decide upon – it was more stressful and required more research than any vehicle I’ve ever bought! It’s too early to tell you whether I made all the right choices, but so far, so good! If you want to see everything I ordered for this trailer, you can download my spec sheet. Maggi has worked on horse breeding farms (and now breeds her own Warmbloods) for decades. She has done a LOT of trailering horses around and was an invaluable help to me in deciding what was worth spending money on and the differences in driving a gooseneck vs bumper-pull, or 16′ vs 20′ vs 24′ trailer. A gooseneck hitch trailer (where the hitch is in the bed of the truck, not at the bumper) is far more stable on the road. You also don’t have to worry about loading your heaviest horse in front – the rig is stable enough (especially with a Dodge Ram 3500) to just load your most difficult horse first, regardless of size. I was seriously debating between the 16-foot trailer – which felt easy to me. And the 20-foot length trailer which felt like it would be a challenge. And then I wondered – having 5 horses – if I shouldn’t go with the 24-foot which would fit them all easily! Well, Maggi has loaded horses loose many times and said that if my horses get along well, that 5 would likely fit in the 20-foot just fine. She also told me that there is no difference driving or parking a 16-foot vs a 20-foot trailer, but that a 24-foot trailer made a significant difference in room needed to park or turn around. Oh my gosh, advice like that is pure GOLD to me. So I went with the 20-foot length. I visited 4 different trailer sales yards to look at all the different types of trailers in person; to open the doors, stand inside them and have the salesperson close the door on me. I wanted to FEEL what my horses would feel. And I have to say, every ‘normal’ horse trailer – with its tiny windows – felt terribly claustrophobic to me. There’s no way I myself would ever want to ride in one – so how would I be able to tell my horses they should get in, and it would be fun??! The trailers that felt the best to me – lots of light, open, spacious – were the stock trailers. Normally people have one or two rows of open slats on their stock trailers, but I ordered three rows open. Perfect! I can get plexiglass panels that slide into the rows to close up the trailer if I wish. Featherlite only offers smoke-colored or red (!?) plexiglass panels – uh… no thanks. But I found a local custom plexiglass company who can cut whatever I want in clear (or any color) if I decide I want to close it up, or just close up some of the rows. 7’6″ is considered a Warmblood, or Draft height horse trailer. But when I stood in one, it didn’t feel that great to me. 8 feet is the highest trailer I could order, without having to pay an additional $15,000 for reinforced sides and I tell you, that extra 6 inches of height makes a world of difference. If I had 14 hands high or smaller horses, I would not have ordered the trailer 8 feet wide – because that extra width makes a big difference getting through 10-foot gates, or staying in your lane on country roads. But for my big guys, I like the extra width. I still find it very challenging to drive this rig – not just because of the length, but also the 8-foot width puts me at the same width as many of the big dump trucks or 18-wheelers on the road – and you’ve seen how much of the lane they take up! I don’t have a place to keep my trailer where I can get it in and out once the weather turns mucky. So I’m just going to leave it in the field and then once the ground hardens, I’m going to hire my friend’s Dad (who drives a logging truck) to teach me how to drive and park the dang thing, so I don’t feel panicked at the thought! And yes, of course, I’ll video the lessons to share with you when the time comes. that is one cute trailer!! Michelle I find this absolutely fascinating! I’ll bet Dreamer recognized the sounds of the trailer, and we know from controlled experiments that horses can recognize different people from photos, so I’ll bet he could recognize (cognitively) what was happening pictorially in the video. I found it very interesting that he kept switching from the front of the screen to the back of the screen and then nudging the back with his nose. In one place he had those tension lines around his eye – just the same as Aude gets when she’s standing at the open trailer door. Now you’ve really got me thinking! What would happen if we played this video on a large screen TV where horses could see it easily? Of course the horses would need to be unrestrained in a large field, so they could come and go, or gallop off stress etc. What would happen then?? AND what would happen if you showed horses suffering trailer-trauma a large-screen video of horses at liberty enjoying getting on and off a trailer? And you played that video until they seemed almost bored by it. Then you drove up with that exact same trailer to their field – so they were completely at liberty – and opened the door? What would happen then?? Oh my gosh, so many interesting experiments! I loved watching this and all that you, humans and horses, discovered/uncovered! Those horses, so full of life and personality! It’s so exciting to see! I am starting to put my feelers out for a trailer, and so this is very helpful, thank you! Yes the whole trailer decision! You should have a lot more choice though as your 2 are not too big. Feel free to call Maggi and pick her brain – if you end up buying from her (they have used trailers too) she can have it delivered to you in Portland. Maybe you should show yours the video of Michelle with 1 of her horses going in and out of her trailer at liberty (where she’s sitting on a chair) and see what they think of it! I want them to be very comfortable, and I also wonder which is the best trailer for them…. In doing a little research I see the new ones have better suspensions, so better for them to not bounce around. Then I wonder about them being tied, what is that about? Everyone ties their horses, but it must be hideous for their faces to absorb all the movement???? I want to let them be free, what do you think about that? Yes, all good ideas! I’ve already practiced with a 2-horse – loaded and empty. But I’m going to do LOTS more empty practice with this one. Remember, our horses greatest place of safety (or anxiety) is us! So if we are feeling at all nervous, unsure, inexperienced, that is going to translate directly to them. AND I am NEVER going to tie my horses – unless they ask me to! 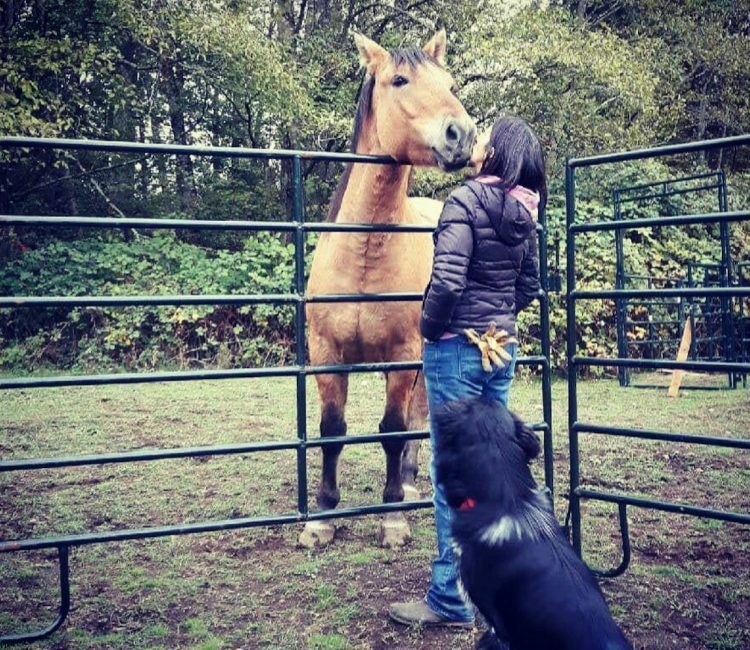 I trust my horses to be able to find the best position for their bodies – and the best head height. It all comes down to how comfortable the horses are in the trailer. If I work with them at liberty, so they are perfectly comfortable (not afraid or worried) then I will not even put a halter on them. When we arrive, I will go in and halter them and bring them out. IF I don’t feel safe going in there to halter them, then I have not done enough practice with them so they feel safe and calm. Have you seen photos of horses who hung themselves in a trailer (from the halter/rope)? It’s a pretty crazy idea. 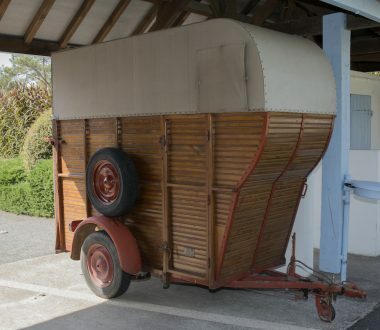 I don’t know of any reason it exists other than fear; fear of the horse damaging the trailer, fear of the horse taking off when you open the door, fear of the horse moving around while you’re driving, etc. Maybe if I were trailering other people’s horses there would be a reason to tie them… but for my own, I prefer to work at the source of all issues and resolve them there. And btw, if you’re getting someone else to trailer them, ASK if they will insist on your horses being tied – many do. Seeing how much trauma they go through and how long it takes to heal it afterwards, I would either drive them myself now, or hire an 18-wheeler air ride trailer with a box stall. That’s what I did for Zorra when she came from New Jersey and she was in great shape (mentally, emotionally, physically) when she arrived.